Abstract. 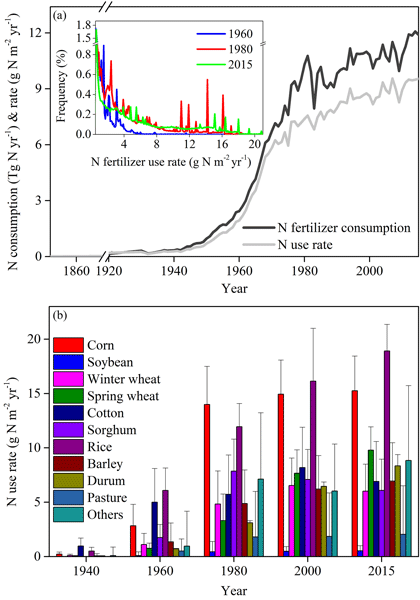 A tremendous amount of anthropogenic nitrogen (N) fertilizer has been applied to agricultural lands to promote crop production in the US since the 1850s. However, inappropriate N management practices have caused numerous ecological and environmental problems which are difficult to quantify due to the paucity of spatially explicit time-series fertilizer use maps. Understanding and assessing N fertilizer management history could provide important implications for enhancing N use efficiency and reducing N loss. In this study, we therefore developed long-term gridded maps to depict crop-specific N fertilizer use rates, application timing, and the fractions of ammonium N (NH4+-N) and nitrate N (NO3−-N) used across the contiguous US at a resolution of 5km × 5km during the period from 1850 to 2015. We found that N use rates in the US increased from 0.22gNm−2yr−1 in 1940 to 9.04gNm−2yr−1 in 2015. Geospatial analysis revealed that hotspots for N fertilizer use have shifted from the southeastern and eastern US to the Midwest, the Great Plains, and the Northwest over the past century. Specifically, corn in the Corn Belt region received the most intensive N input in spring, followed by the application of a large amount of N in fall, implying a high N loss risk in this region. 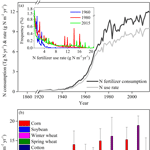 Moreover, spatial-temporal fraction of NH4+-N and NO3−-N varied largely among regions. Generally, farmers have increasingly favored ammonia N fertilizers over nitrate N fertilizers since the 1940s. The N fertilizer use data developed in this study could serve as an essential input for modeling communities to fully assess N addition impacts, and improve N management to alleviate environmental problems. Datasets used in this study are available at https://doi.org/10.1594/PANGAEA.883585. How to cite: Cao, P., Lu, C., and Yu, Z.: Historical nitrogen fertilizer use in agricultural ecosystems of the contiguous United States during 1850–2015: application rate, timing, and fertilizer types, Earth Syst. Sci. Data, 10, 969-984, https://doi.org/10.5194/essd-10-969-2018, 2018.